Audi has taken the covers off the new TT RS, the £50,000-or-so flagship coupé whose arrival itself is no big surprise. What is surprising, however, is its pace: 0-62mph in 3.7 seconds, just 0.2 seconds off the £120,000 Audi R8. 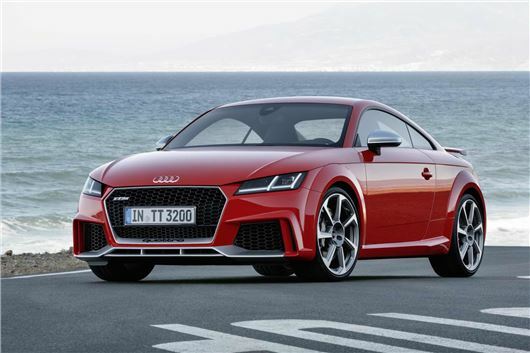 Unveiled as both a Coupé and a Roadster, it’s the most powerful series production TT ever and although prices aren’t announced yet, the order books will open in Summer for first deliveries around Christmas time. Powered by a five-cylinder turbo engine with 400PS (up from 340PS last time around) and 480Nm torque, it’s four-wheel drive and the only gearbox option is a seven-speed S tronic automatic. Top speed is 155mph, although you can ask Audi to lift that to 174 if you wish, while the slightly heavier Roadster lifts the 0-62mph time to an embarrassingly sluggish 3.9 seconds. Unveiled formally at the Beijing Motor Show, the TT RS sticks with the model’s lairy tradition in the looks department, with exterior addenda including a fixed rear wing, wide side skirts and a completely redesigned front end. The wheels are 19-inch as standard but a set of forged 20s are optional. In the cabin, an Alcantara steering wheel sets it apart from common-as-muck TTs, and the sports seats are embossed with the RS logo. Audi’s Virtual Cockpit instrument display is standard. Audi hasn’t said what the fuel efficiency figures are like, but expect it to land a couple of mpg better off than the outgoing TT RS, which returned 33.2mpg officially.